Answer: Although we got to know that we were advancing during the convention, we also received another great addition. Now we not only believe in the teacher and in our correct advancement, but we also understand that in addition to that now we have to advance in greater “faith above reason.” This means that thanks to the message we received, we can advance in greater faith now. If we advance correctly we will encounter greater problems as the ego will pull us more strongly backward and we will still have to advance above it and against it. “Faith above reason” means faith against reason. How can we advance against reason? When we advance in spirituality, every level annuls the previous level according to the spiritual law of “negating the negative.” Each time we grow, we become wiser and more clever and our knowledge on the next level is opposite from the knowledge on the previous level. Every Partzuf is made of ten Sefirot, from Keter to Malchut. Malchut of the upper becomes Keter of the lower, which means that it changes its attributes to the opposite attributes. However, when we ascend, Keter of the lower becomes Malchut of the upper, and thus also becomes the opposite. 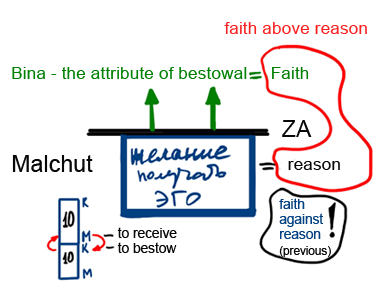 Malchut is the attribute of receiving and Keter is the attribute of bestowal. So each time we ascend, we need to turn the receiving into bestowal, to “faith above reason.” When you ascend to the next ten levels, since your Keter has become Malchut, it’s as if you negate all your previous knowledge and all the ten Sefirot you had on the previous level become the opposite and are incorrect in the next state. It’s like speaking to a child who sees things from his level, while you see it totally differently. The reasons and the actions are different, although you see the same outcome. “Faith above reason” is faith against reason. It always negates the previous reason and you should advance against it, which means above it. I have the previous knowledge and still I advance according to faith. What my friend tells me means the external vessels, the external attributes are more important to me, and I accept it as more accurate information that is clearer and more correct than mine. So if the group decides something, I immediately accept it and although it’s clear to me that there is less than a thousand dollars here, I accept it as a thousand. It’s a substitute for me. On the whole this seems totally illogical and unrealistic, and it is indeed so. Baal HaSulam says that certain people may seem wicked and others righteous according to their attributes and then we see them in the opposite manner, certain people seem rich and others poor and then we see them oppositely, certain people seem clever and others foolish and then the opposite. Everything depends on us. In the spiritual world we change the picture completely by changing our attributes. The bodies and the connections between them are revealed in a totally different manner. So “faith above reason” is the means by which we advance and ascend the spiritual ladder. We cannot do it otherwise! ”Faith above reason” is faith opposite from what we knew previously. If we don’t have faith against what we knew before, we would never rise from one Partzuf (state) to the second, the third, and so on. This is how the transition takes place.